A grand total of 70 users have rated Rotor DR1 on IMDb since it was released a month ago, a tiny number when compared to major motion pictures, but not surprising when you accept that this is an indie film at the genre’s smallest. Watch the trailer for a little bit of insight, and understand that this is, in some ways, a project more than a movie, paying homage to a lifestyle & a hobby more than it is vying for an Oscar nod. I tried to keep that in mind while I watched, remembering that the filmmakers had a small budget, limited special effects, a small pool of talent to choose from, and relied heavily on their own ingenuity to get this thing off the ground. 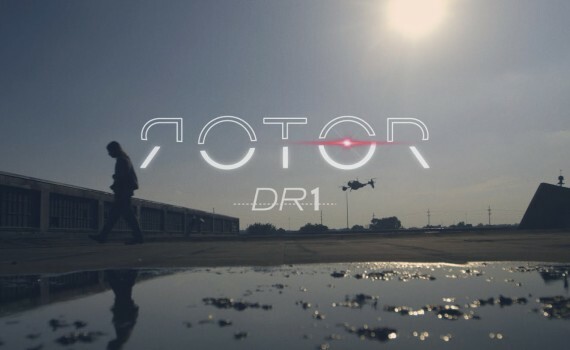 In the end, Rotor DR1 is less sci-fi and more fun with drones, but then again, drone enthusiasts might be the only people who see it. In the near-future, a super flu (a la The Stand) will wipe out the majority of the world’s population, leaving society in ruins and humanity surviving on the fringes of once-bustling cities. Before the end came, the United States government tried to help, pumping money into Sky Lab, a company that was tasked with producing a vaccine for the flu and using small drone aircraft to deliver it to the populace. Well, that didn’t work, so now there are only a few “lucky” immune survivors with countless drones flying around overhead all day. Kitch, a boy whose father worked on the drone program, has been left on his own and hunts drones in order to harvest their power sources. He dreams of finding his father, and the discovery of an aircraft with artificial intelligence fuels his hope that somewhere out there his dad is still alive, waiting for him. If I were a member of this online drone aficionado community, if I had helped get this film going, if I had worked on it in some small way, if I had a stake in its success, I could see loving this odd gem of a movie. It feels very personal, like a ton of heart was poured in, like many worked much, leaving audiences with the feeling that someone cared. And backed by a cool post-apocalyptic premise, the story is actually pretty fun, with humans using robots as currency, a strange culture springing up around the concept. But, and I hate to be the one to say it, Rotor DR1 is a movie for hobbyists, not for critics. The kid who plays Kitch is not a good actor, simply put, and fails with every facial expression. His sidekick Maya is actually solid & likeable, but every adult in the film comes across as a community theatre actor, not a professional. I wanted to like this movie; there was hard work involved, time invested, passion infused. But the acting was pretty awful, the drones were underwhelming as the only source of sci-fi technology, and the movie as a whole just isn’t a crowd-pleaser that anyone will be demanding come to their local multiplex.